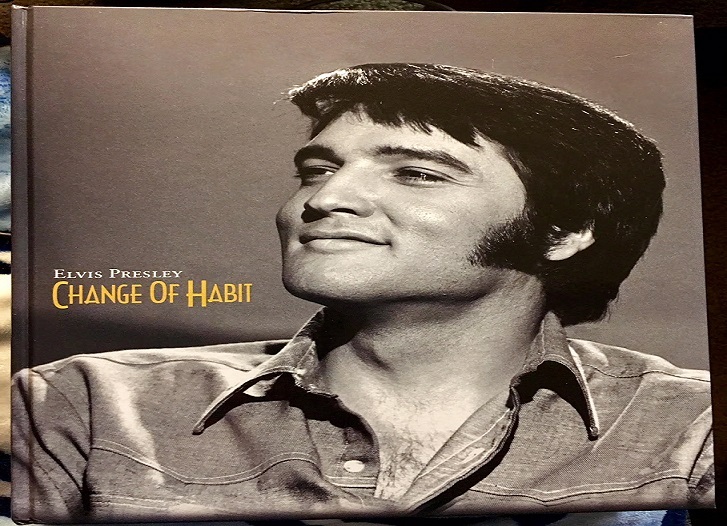 I first saw this HUGE Change of Habit book at Graceland over New Year’s. It was an FTD release in 2015 about the making of Elvis’ last movie. And when I say huge it is over 400 pages (over half are photos from the movie), and it is physically large like a coffee table book but with lots of information. The book also comes with the cd Let’s Be Friends released in 1970. As soon as I got home (as it was to big for the plane), I ordered it as Change of Habit is my latest Elvis movie obsession. I learned a lot from the FTD book Elvis Presley Change of Habit, as it has so much more information than I expected, more than any coffee table book. The movie Change of Habit was part of a deal with the NBC Special (aka ’68 Comeback Special) the Colonel made. Originally it was a ‘regular’ movie, not an ‘Elvis Presley’ movie (ie they didn’t design the movie with Elvis in mind). They needed to fulfill a contract, so the script was rewritten with a part for Elvis. Originally Mary Tyler Moore was supposed to get top billing, it was her movie – she was to be the lead. Maybe that is why everyone interviewed for this book years later described MTM as standoffish, aloof, all business and not really friendly. On the other hand, everyone interviewed for this book said Elvis was the friendliest, nicest and most down to earth person. The cast, the crew, the fans watching filming, the director all said Elvis was the nicest person – and how his hair was dyed way too black. The director William Graham said, “Of all the people I’ve ever worked with in my entire life – and I’ve been a director for forty-seven years – Elvis was the nicest man I’ve ever worked with.” Graham also said Elvis was particularly good at comedy and fight scenes, but struggled with the dramatic scenes which he helped him with until the Colonel put a stop to it. They actually filmed some scenes of Change of Habit at an all Catholic Girls School during Easter Break, but then had to reshoot when the girls were back in school. Everyone said how nice and down to earth Elvis was and how aloof and business-like Mary Tyler Moore was. They said Elvis would sit down and have conversations with them and was actually interested in their plans. They all said how great and thin Elvis looked and how overly dyed black his hair was. While filming the football scene in Magnolia Park in North Hollywood, fans were roped off. Elvis would walk the rope line and sign autographs and take photos and talk with everyone. They all said he was the nicest person ever. In between takes of “Rubberneckin,” Elvis played songs and sang with the cast like Barbara McNair and Darlene Love. The Blossoms (including Darlene Love) backed up Elvis in the ’68 Comeback Special as well as on Change of Habit. Elvis got a kick out of watching his now close friend and costar Jane Elliott (future Tracy Quartermaine on General Hospital) dance while he sang “Rubberneckin.” It seems Elvis and Jane were quite close (maybe even an affair?) and remained friends for years after filming. Throughout the book, everyone interviewed referred to the movie Change of Habit as a comedy. I have never viewed it that way, although there are a few funny lines. I always thought the movie was very dramatic, very serious. Am I missing something? This was Elvis’ last movie, and my latest obsession. Elvis just looks SO beautiful in it! In Change of Habit, Elvis plays a doctor (which I’m sure he loved) in the ghetto (pun intended). This is such a departure for Elvis, and a welcome one. Change of Habit is an actual drama with a real story line – his only socially conscious movie dealing with race relations (with maybe the exception of Flaming Star). One of my favorite lines is after hearing a racist comment they say, “It seems our neighbors are Catholics. Too bad they’re not Christians.” Elvis’ character Dr. John Carpenter (an alias Elvis actually used in real life along with John Burrows) runs a free clinic where three disguised nuns (played by Mary Tyler Moore, Barbara McNair and Jane Elliot – who went on to play Tracy Quartermaine on General Hospital for years) help him try to make the neighborhood a better place. Of course Elvis’ character falls in love with Mary Tyler Moore’s character because he doesn’t know she’s a nun. Ed Asner plays a policeman. This was the first pairing of Ed and Mary and a bit of foreshadowing as they would be star together in The Mary Tyler Moore Show the following year. My favorite parts are the performances of “Rubberneckin,” “Let Us Pray” and the incognito “Lawdy Miss Clawdy,” when Elvis’ character says “I’m from Shelby County Tennessee” and of course the football scene with Elvis wearing the UT Memphis sweatshirt that I now have a replica of thanks to Beth Hilton. I noticed A Martinez in one of the first scenes running down the street chasing the woman – A Martinez as in CRUZ CASTILLO from Santa Barbara! Change of Habit has become one of my favorite Elvis movies moving up to my eighth favorite Elvis movie.